Maria’s 50th birthday was coming up and her friends and family wanted to throw her a big party but all she could think about was how awful her face looked. She had wrinkles etched across her forehead, deep grooves by the side of her mouth, horrible spider veins on her left cheek and her skin felt rough and looked dull. She also had lots of freckles and spots – the result of too many years of uninhibited sunbathing. There was no way she wanted a party if she was going to look like this in the photos! Maria was pleasantly surprised to discover that there were plenty of alternatives to cosmetic surgery. These non-surgical cosmetic procedures used advanced technology to repair and rejuvenate the skin, without needing to do invasive surgery – and they could make a big difference in improving the appearance of the face. After doing her research, Maria decided to go for several procedures which would help to improve the appearance of her face. “I decided I would have some Botox to remove the fine lines and wrinkles on my forehead, especially my frown lines. I also had crows feet at the corners of my eyes so I wanted to get rid of those,” says Maria. 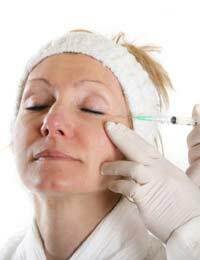 “Finally, I had some dermal filler put in. I went for hyaluronic acid, which is a natural substance that’s produced by your body. They injected this into the deep grooves I had on either side of my mouth. It was amazing – I looked so much better! I could have also had some in my lips but I decided in the end that my lips were still OK,” chuckles Maria. Maria also decided to have a procedure to remove the spider veins in her left cheek. This was done injecting a solution directly into the veins, followed by intense pulsed light therapy. On the night of her 50th birthday party, Maria looked in the mirror and could not believe her eyes. She looked at least 10 years younger. Her skin was glowing and radiant, her forehead smooth and her cheeks flawless. She felt wonderful and was delighted with her choice of non-surgical cosmetic procedures. “Of course, they’re not permanent,” says Maria sadly. “I’ll have to get them redone at some point. And also, they don’t really stop ageing, you know. The natural ageing process continues. And I know that I’ll have to maintain a healthy diet and lifestyle if I want to keep the effects of these treatments for as long as possible. I just wish there was an alternative to exercise!” laughs Maria.